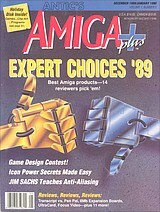 Cover Story Expert Choices '89: Best Amiga products - 14 reviewers pick 'em! Reviews, reviews, reviews: Transcript vs. Pen Pal, 8Mb Expansion Boards, UltraCard, Focus Video - plus 11 more!